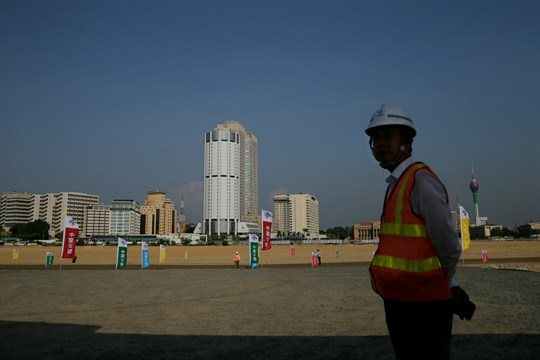 A Chinese construction worker stands on land that was reclaimed from the Indian Ocean for the Port City Colombo project, Colombo, Sri Lanka, Jan. 2, 2018 (AP photo by Eranga Jayawardena). No stranger to political controversy, the International Monetary Fund may soon find itself embroiled in one that pits China’s interests against those of the United States. Beijing’s hugely ambitious international development project, known as the Belt and Road Initiative, is raising fears of debt crises in the developing world, and the IMF may be called in to clean up the mess.